There’s a lovely community spread all across the world of people the same kind of ridiculous as me. We are the house show hosts and listening room presenters who convert ordinary spaces into welcoming live music venues and don’t take any money for it, because that’s how much we believe in the necessity of helping real artists make a living. It was through this network of hopeless romantics that I became familiar with Lula Wiles, who are frequent favorites of my cohorts at Billsville House Concerts in Vermont. As native Nor’easters, Ellie, Isa, and Mali have built up a following in their stomping grounds between Boston and NYC, but when it came time to make their Memphis debut, we had the great good luck to welcome them. 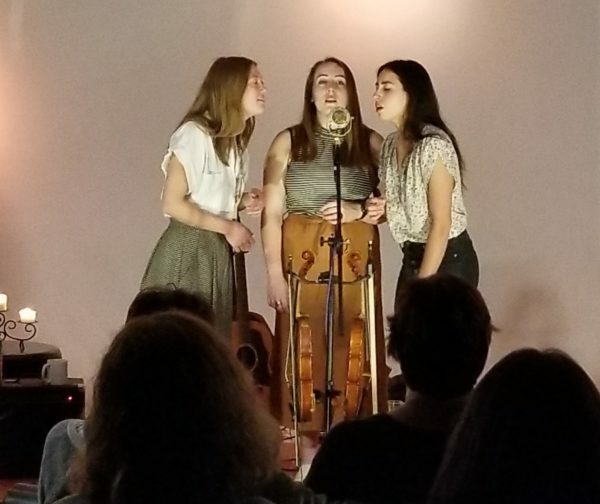 This was the second time I’d booked a trio and there were interesting parallels with our friends in Nobody’s Girl, most notably that all three artists were amazing singers, songwriters, and multi-instrumentalists in their own right. They were also all Berklee alums, like our friends Rebecca Loebe and Hadley Kennary. Even knowing all that background, however, I wasn’t really prepared for the alchemical magic that happened when they got on stage together. While it’s apparent that there are some stylistic differences in how each of these songwriters approaches their subjects, the way they work together to bring them to life makes each song feel like a shared experience. It’s generally said by reviewers that they take turns “on lead,” but really, what they do is more like guiding than leading. One vocalist may be centered, but the other two are always at her side, and the song wouldn’t be the same without all of them. There is an abundance of videos from this show, because there was such a rich and unexpected tapestry being woven and I just couldn’t stop wanting to grab on to what I was seeing and hearing. Likewise, the audience was completely enraptured and couldn’t stand to see the night end. After encoring with a rousing Fountains of Wayne cover, the band closed out their first show in Memphis with a room full of devoted new fans. I played a fun game afterward and went through some of Lula Wiles’ lyrics online to see if I could guess the writer without hearing the song. Mostly I could, because Ellie has a twangy vintage vibe, Isa brings a flowing romanticism, and Mali adds a sharp-eyed edge. Brought together, their styles create something rare in Americana: an intricate, modern take on folk tradition that twists the form from nostalgic to progressive. The chance to highlight work like theirs is the reason Folk All Y’all exists, and it was an honor to be part of their journey.